"Peter Weibel, Rewriter: Early (conceptual) photographs, (expanded) films, (body) videos and (contextual) works, 1964-1975"
A video archive published in conjunction with the Slought Foundation exhibition (2009)"Peter Weibel, Rewriter: Early (conceptual) photographs, (expanded) films, (body) videos and (contextual) works, 1964-1975"
This video archive with accompanying essays traces internationally-renowned media and conceptual artist Peter Weibel's artistic developments from his beginnings through 1979. Weibel started out in 1964 as a visual poet, and was soon transferring the structures of the visual culture from the page to the screen, while still retaining the model of language as one of perception. Later, he developed a critical impulse that turned not only against art but also against society and the media itself. This specific development from the page via the screen to gallery space—all happening as early as the 1960s—anticipated many of the trends that were later to be described as conceptual art, context art, institutional criticism, and intervention. Peter Weibel was born in 1944 in Odessa, and lives and works in Karlsruhe, Germany and Vienna, Austria. 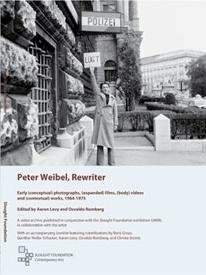 Since 1966, Weibel has created conceptual photo-literature, -texts, -objects and -actions, as well as audio pieces. At the end of the 1960s, he worked in the field of Expanded Cinema, action art, performances and film together with his partner Valie Export. His interdisciplinary activities comprise scientific, artistic as well as literary, photographic, graphic, plastic, and digital works. Weibel was, and continues to be, an early and eloquent champion of a theory of communication responding to the rise of new media. Beginning with work in the tradition of visual poetry, Weibel produced “media-based literature” in the form of paper, photographic and object poems, body texts and material poetry, text objects and video texts. Conceptual works and actions followed, together with media analyses employing the media under scrutiny, initial TV experiments on Austria's ORF, and later numerous installations deploying film and video. The publication of candid sexual representations in a black book on Viennese Actionism led to a lawsuit against its publishers Valie Export and Peter Weibel in 1970. Both artists continued to support each other's projects into the late 1970s. His subjects are less body-oriented, however, and deliver from a media-specific and semiological viewpoint. His works question the cult of the artist through socially critical analyses of media and systems including film, television, and the visual arts. Weibel considers his theoretical and curatorial work to be a facet of his artistic practice. He is the Chief Curator of the Neue Galerie, Graz, and since 1999, chairman of the ZKM Zentrum für Kunst und Medientechnologie, Karlsruhe (www.zkm.de). His many exhibitions curated and publications edited include Making Things Public (with Bruno Latour, 2005) and Future Cinema (with Jeffrey Shaw, 2002). He has been the artistic director of Ars Electronica in Linz, Austria, Professor at the University for Applied Art, Vienna, commissioner for the Austrian pavilion of La Biennale di Venezia, and director of the Institut für Neue Medien, Frankfurt (1989–94).